As we’ve discussed in previous posts, changing your furnace filter is one of the easiest and most important HVAC maintenance tasks any homeowner can put into their regular chore rotation. Operating your furnace with a dirty filter puts a strain on the entire system, wasting energy and allowing irritating particulate to make its way into your home. However, if you’re looking to replace the furnace filter for the first time, you might find yourself standing in the filter aisle of the home improvement store wondering how on Earth you’re going to decide which option is best. Never fear! In this post, All Air Heating & Cooling Services takes a look pros and cons of the most common filters on the market. 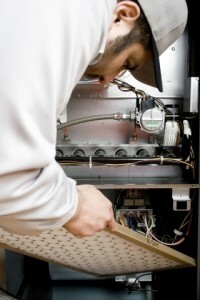 This is by far the cheapest and most common option for most home furnaces. Made from spun fiberglass, it’s designed to catch large particulate like dust, lint, and debris from making its way into your duct system. However, it does little else to clean the air. Although these filters are slightly more expensive than the disposable fiberglass options, they’re better at removing smaller particulate like mold spores and dust mites. However, they clog quickly so they have to be changed more often than other filters in order to prevent unnecessary strain on the furnace. These filters can sometimes be twice as expensive as disposable pleated filters, but they’re also more effective. Designed with self-charging electrostatic fibers, these filters are able to attract tiny particulate like a magnet. This is especially important if you have children, pets, or smokers in your family. At the top of the furnace food chain is the permanent electrostatic filter. Just like its disposable relative, this filter features fibers that attract tiny particles that can dirty your duct and aggravate your allergies. However, it has the added bonus of being reusable. Remove the filter and toss in your washing machine for up to eight years of clean air without a lot of other HVAC maintenance.